As many as 50,000 people took to Vancouver's streets for Operation Solidarity demonstrations in 1983, in response to massive cuts by B.C. 's Social Credit government. Thirty-five years ago today, as many as 50,000 people from anti-poverty advocates to punks took to Vancouver's streets for the Operation Solidarity demonstrations in response to massive cuts by B.C. 's Social Credit government. Joe Keithley of punk rock band D.O.A., who wrote General Strike to support the movement, was part of the opposition to austerity. "There was a feeling that we could change society and make something better and help people," he told Stephen Quinn, host of CBC's The Early Edition. The protests, which began on July 23, 1983 and went on for roughly three months, were ignited in response to 26 bills that were passed affecting education, health care, the human rights branch and other sectors. "When I started out 40 years ago doing this stuff, we were fighting racism, sexism, greed, warmongers," said Keithley. "Now 40 years later, it's the same four things basically." The bills, which were later dubbed the "26 lashes," abolished watchdog-type bodies, undermined trade-union practices like collective bargaining and cut social services. The B.C. Federation of Labour, along with community and advocacy groups, organized the mass protests. 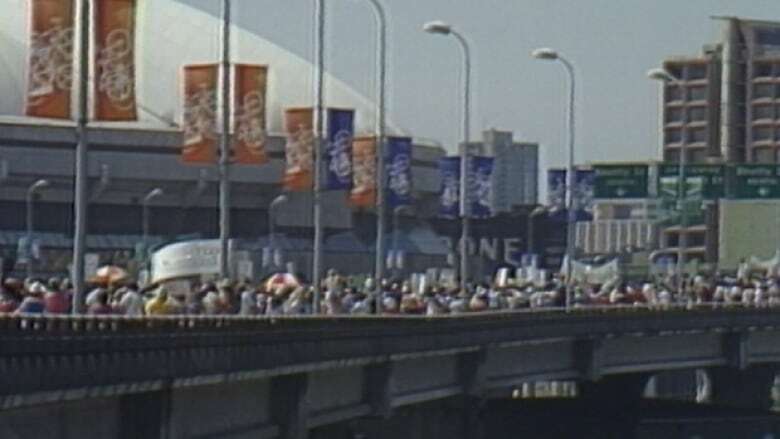 Huge marches and rallies were staged across Vancouver, from Empire Field to the Queen Elizabeth Plaza. "We wanted to stop the bills," said Jean Swanson, an anti-poverty advocate who was with the Hospital Employees Union but was seconded to work on Operation Solidarity. "You always get a kind of high in those marches, everyone is chanting and you do feel powerful." By November, 130 days after the movement started and under threat of an impending general strike, an agreement was reached between the trade union officials who started the protests and the government. Not everyone was satisfied with the agreement reached though, said Swanson, because it seemed to favour labour interests over community advocacy ones. "The community groups really felt sold out," said Swanson. "People were depressed about it." But, she emphasized, the movement wasn't all for nothing. "Coming right out of that, we set up an anti-poverty coalition, End Legislated Poverty," she said. "We've been doing 40 years of austerity and this was just another step."